Brown and Spencer led the few remaining survivors back toward Tucson in small quarter of a mile bursts. They would find a defendable area and hold it, firing at the advancing zombies, until they drew too close. Then the small team would jog to their vehicles and drive to the next defendable spot and repeat the process. Of Haeds there remained no sign. Each time they needed to retreat, it was getting harder to get Mel to join them. After the death of his friend, the man wanted vengeance and he had enough bullets to make it happen, unless he got overwhelmed. Soon however the remainder of the group found their bullet supply running low. After reaching another retreat, Brown and Spencer walked to the lip of the incline they had staked out for the next slaughter. They had parked the vehicles on a small hill that gave them an excellent view of the remnants of Haeds army marching at them from below. Overhead, Spencer caught sight of the black shapes of vultures riding the hot thermal drafts, created by the scorched desert sands, and briefly wondered if they waited for them. “How many do you figure are left?” he asked Brown. They watched the zombies slowly stumble over the harsh cactus filled terrain. Many were filled with thorns and balls from jumping cholla. Any living person would have been crippled in agony, but they kept trudging through the brush headless of all obstacles. The zombies were just getting close enough for them to need to prepare. Already Mel and the punker Wart were standing where the road lead down the incline. That was when they heard the scream. This was followed by some cursing and then a load boom as the noise from Devon’s shotgun echoed off the mountains. As one, the rest of the men went charging to the rear. 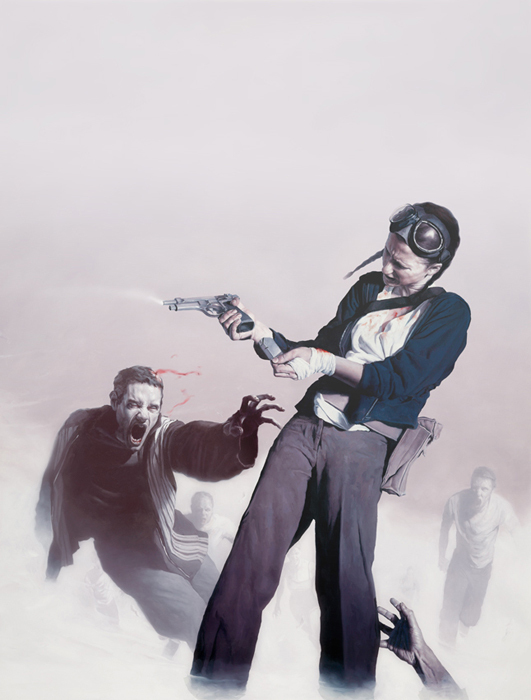 They found Kimberly smashing the head of a zombie who already lay prone along the road. Rollie was firing the shotgun from his wheelchair. Spencer’s eyes opened in alarm. They had gotten too close to Tucson and another group of Walkers had cut them off. “We’re trapped,” he whispered to himself, and he moved forward and helped Rollie shot down the nearest foes. Check out the beginning of the adventure here!